Have you ever had those times where you feel like shouting “Won’t I ever get a break!” For me it’s a regular occurrence, but I know that I also have the power to withdraw from the things of less importance. Yet, I am torn with the choice to do many things mediocre, or a few things very well. As for now I’ve decided to slow things down a little bit and make homework a bigger priority. I thought I was doing better with things, but somehow I got so busy with intramurals, meetings, work, and other things that I didn’t start studying for my Theatre Arts History class until the night before. That day I had also swam and played soccer so I was exhausted by the time I started. Needless to say I fell asleep studying. Luckily my work allowed me to come in later, but studying in the morning did not prove to be enough. I ran to class only to find that I had showed up early and had left all my books at home. Others showed up and we reviewed things, but when I got the test I knew I was in trouble. I had 50 minutes to fill out a short answer, essay question test, and I knew barely half of all the terms. I didn’t do very well on the test, but I didn’t have time to worry about it because I had to get everything ready for the exec retreat for Azalea. We were leaving to the President, Caitlin’s house in Arlington to do something fun as exec and to make plans for the upcoming year. I had a crazy week, and I wasn’t really excited about going since I had a LOT of homework to do, but oh well. projects. The first one we had to use certain materials to protect an egg from breaking when dropped (shown at left), and the second was a contraption to go down a string to pop a balloon. It was hard and I was unsuccessful both times, but it was fun trying. Later on in the evening after meetings and free time (where I managed to study some) we did a runway project game. We went all over the farm gathering supplies for our dresses. It was pretty impressive what we came up with in the 30 minutes or so we had to find and assemble our outfits. 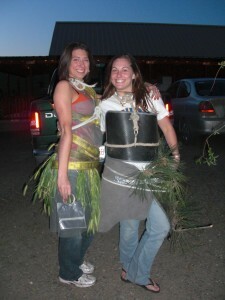 My friend Jen and I (shown at right) ran and found a lot of ropes, some floor mats of cars, and chains from one barn. It worked out pretty well, especially with the ropes. We went down the runway a couple at a time where we were judged. The judges made their final decision between the two groups, and although we lost we definitely felt like we had the most creative costumes. It was hard to prepare to go home after so much time playing games, and bonding as exec members in the middle of nowhere. Jen and I decided we’d leave last with Caitlin the president so we could walk around before we left. 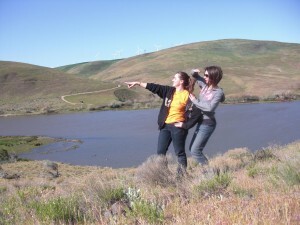 We went on an adventure where we climbed under a barb-wired fence, hiked up and down hills, and strolled along the river. It was absolutely beautiful. I was very glad we had stayed so I was able to see the farm. We also had some fun in a small junk yard with old beat up cars. 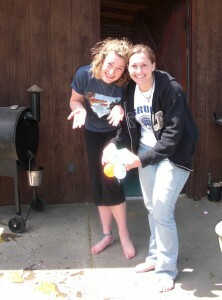 The day was only half way through, and we had done so much. The drive home was nice and I reflected on all that had happened. I didn’t study as much as I should have, but I certainly feel like I learned a lot more about some people there, and I grew a lot closer to exec members in general. I really enjoyed our little vacation, and I feel in a way that what I gained was more important than studying for a test. This week was really crazy as I had to write so many articles for the newspaper. I was covering the ASOSU senate meeting on Tuesday and was shocked at the first item of business. A senator made a public accusation and request for a censure of an ASOSU employee regarding sexual assault and/or harassment. Not only was this an unusually filled meeting due to other business being addressed, but we also had the privilege of having an Oregon State Senator present to support a resolution concerning gun rights later on in the meeting. You can imagine what kind of havoc took place, and it was finally determined to wait until those affected can come up with a resolution of their own with the office of Affirmative Action and Equal Opportunity. However, it took nearly a long time to get to that point. It was a crazy meeting, but it felt like real politics in the making. Every senator has an opinion and all of them are trying to gather sufficient information to make a decision, but the end result is often to wait until there is more information. Here is the link to the article: http://media.barometer.orst.edu/media/storage/paper854/news/2009/04/15/News/Senator.Faces.Censure.For.Sexual.Assault.Accusations-3710772.shtml. With that out of the way, I could focus on the rest of the things I had to do. I had to sign-up teams for intramurals, sign-up girls for the Beaver Strides Program, and I had a test Thursday. Unfortunately the main thing that suffered was my test. I studied only the night before and a little in the morning and got a 78% on it. I have to get a perfect score on the next two tests to pull out an A- in that class. Sometimes we have to learn the hard way, although I’ve learned that lesson before. 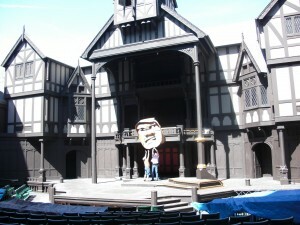 This weekend I left to Ashland for the Shakespeare Festival for an Honors College class. I had lots of homework to catch up on, but it was a class. I didn’t really know anyone, but that gave me more of an opportunity to read on the bus anyway. When we got there we were put in rooms of four people, and that’s how I met Jessica and Jill. We all didn’t know many people so we ended up staying together mostly for the rest of the trip. We went to dinner right before we watched Macbeth. I found that play to be very morbid and bloody. Nothing like a play all about seeking power and murdering those in the way to make me excited about the trip. I figure now that I’ve seen it, that’s good enough for me. We were all tired when we got back to the hotel so we went to bed fairly early. We left at 10 a.m. to the city and spent the rest of the day there. We took a tour of the theatres which was rather fascinating. Our tour guide told us a lot of interesting stories about things that had happened at the theatre. It was really neat to go back stage and see how everything works, and I found it astounding how talented the actors are to be able to do all that is required of them. That day we watched Death to the King’s Horsemen and Equivocation. I was glad both were on a lighter note. Death to the King’s Horsemen was interesting because it’s a true story and dealt with a lot of racism. It’s not a happy ending, but it truly depicts how little the British understood native customs in that time period. Equivocation was by far my favorite since it was also the funniest, and had a somewhat happy ending. The play consisted of only five men and one girl. It was amazing how they changed from one character to the next so quickly. One character literally would stand to be one character and would sit to be another one all during one scene. It was great! I had a good, artistic weekend, but I would’ve liked to have finished more of my homework. I finished reading a lot that I needed too, but I still have papers to write, and a test to study for. When will the work ever end? As the witches in Macbeth said “Something wicked this way comes.” In my case, that’s the assignments coming up sooner than I’d like them to. 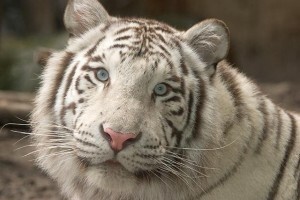 Here is a picture of a Siberian tiger because it reminds me of what my ambitions are and why I work so hard. So I have spent the first two weeks of school doing a lot of relaxing and organizing. I found that I had absolutely no motivation to do anything, especially including homework. It was like I knew the consequences would have to come, but I just didn’t care enough to bother. We all know procrastination is a bad thing, but yet somehow we all find times to do everything, but what we really ought to: homework. Near the end of the week I finally decided that I needed to get moving again and that I had taken too long of a break. One thing led to another and I ended up being lined up to do four stories for the newspaper in one week. Maybe I went a little overboard about getting back involved with things, but I have to admit it feels good to be busy again. Sometimes I think that we have all have some desire to be useful and worthwhile. I find that I feel that way when I get involved in as much as I can. It’s a wonderful feeling to know that you are doing something important. When I finally decided to get out of my pit and do something I realized that what I really needed was just to be working again. It’s still difficult to get back into good studying habits after the break, and just thinking about all the reading I have to do for classes this term is stressful. I’m still rather disorganized which is unusual for me, but I’m just working back up to doing things step by step. I finally did my laundry after a while. It provided a nice excuse to reading, and I decided to watch a movie while I folded laundry. It’s great to be a multi-tasker. Have you ever realized that during the ages 18-30 we have a lot of pressure on us about defining ourselves? We all must seek out what we want to do with our lives. Some people seek marriage, others big careers that will take years to obtain, and many just try to do whatever makes them feel happy. How do we really find ourselves though? I’ve found that works for me is to be busy. I’m unfortunately one of those people that likes just about everything so I find myself always trying to do as much as possible. It’s a miracle I always find a way to do it all. For the last two weeks I thought I was trying to “find” myself and slow things down to where I could think. All of that and I came to the conclusion that I constantly need to be doing something and that I just fret over petty things when I’m not busy. College is most certainly a good time to discover one’s self. It’s when we realize that there’s no one there, but you to motivate yourself. We have to learn how to drive ourselves to do the things that we know we need to do. No one will remind us, no one will care if we don’t do it, and life will continue to go on without us. It is then, that we realize we need to find a way to continue to study and do things of our own will. This Easter weekend I didn’t do much, but I did do a lot of thinking. I’ve recovered from my relaxation period, and I feel alive again. Through my rebirth I’ve gained a better understanding of what is truly important to me. I love helping people, and I feel at a loss when I can’t help those that need my help. There is so much to do in life so why do we waste these precious hours on things that won’t make a difference the next day. We can make a difference in the world, and one large step in that begins with college. If we hope to gain what we need to out of college we will have to learn how to do the homework. You can go far in life if you learn to apply yourself. However, I feel that may be a lifelong goal for the majority of people in this world including myself. This past week has gone by extraordinarily fast. I’ve been busy with homework, work and writing for the paper. Naturally I have been getting few hours of sleep and that always seems to make time go by quicker. However, I don’t think it’s in any way healthy to pass the days half asleep all the time. I was excited for the weekend, but I had a lot of homework and projects to get done for the next week. So on Friday after work I got home and worked on homework. It’s hard to stay motivated on the weekend, but I had to get things done. Mainly I worked on the musical I am doing for my honors college film writing class. I recommend never doing a musical unless you have lots of time. I’m finding it difficult to work around other people’s schedules, get karaoke version of songs, and figure out how to dub the music over the recording. It is a lot of work! I will be filming next Saturday and I’m positive it won’t be how I imagined, but it will be fun. Above is shown many of the girls in the house and a few of them are in the soon to be AZA musical. Friday night I went to a women’s conference. They thought I wrote poetry (I don’t know why) and asked me to share a poem. I explained I didn’t know any poems, but I could make something up. In the end I decided to sing a funny version of the Little Mermaid that I’d heard once. It was a little nerve-racking, but I did it. We played some games and then I rushed to a party. Another co-op called Varsity did a party called the mugger because they serve rootbeer floats. We didn’t stay long, but it was fun to go dancing. Like always, I had to top off the night with a movie and so my friends and I watched “Roman Holiday” with Audrey Hepburn. It was a great night, but 3 a.m. might have been a little late since I had to get up at 8 a.m. the next morning. Saturday morning I went to the second part of the women’s conference. They had different classes, a motivational speaker, and brunch. I was tired, but the classes were interesting. I had the opportunity to help with a computer class where I showed two old women how to use Powerpoint. To my surprise, one of the women knows my grandparents in Utah! It’s a small world. After several hours of doing homework, working on the musical, etc.. 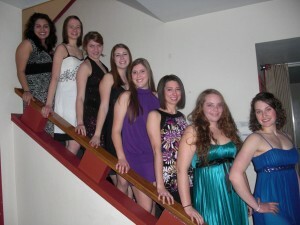 I went to the co-op Avery’s winter formal. Since I just went dancing the previous night it wasn’t as exciting, but I knew more people this time. The theme was Hollywood and two of my friends dressed up. One was a gangster and the other wore a dress. It was hilarious! As shown to the right. So my weekend was crazy, but I had a lot of fun. Surprisingly I didn’t finish all of my homework, but something is better than nothing. Now that finals are getting closer this week is dedicated to studying. Above all though, my priority is to first get enough sleep at night!